Choosing to live a healthier lifestyle involves many aspects of conscious choices that better your personal well-being and planetary health. This involves creating a healthy home, eating more plant based, organic foods and choosing skincare and beauty products that are natural and free of harsh chemicals. While Ron and I have tested many a healthy brands, we’ve found a company that we can’t wait to tell you about. It’s amazing for many reasons, but one of the best parts about Green Goo, is that they’re somewhat of a one stop, safe-skin shop for you, your kids and your pets (oh, and your pits)! When you think of a traditional pharmacy, you think of bottles, pills and synthetic chemicals, colors, additives and preservatives. That’s because drugs are not natural and therefore can be patented. This equals BIG money for the pharmaceutical companies. In fact, today, Americans are unhealthier than ever, yet a recent report by IMS Institute for Healthcare Informatics, which tracks the pharmaceutical industry, reveals Americans spend about $424 billion (with a ‘b’) a year on prescription drugs—and the prices for many of them seem to keep on rising. Hmm, how’s that working for us as a country? You do the math. Nature, on the other hand, cannot be bought or owned. The inherent qualities of an herb or essential oil are a gift to us all with (virtually) no side effects. As they say, if you can’t pronounce it, you shouldn’t eat it (except quinoa, right? You should always eat quinoa!). Well, the same applies to whatever you put on your skin. After all, your skin is your largest organ and it absorbs a whopping sixty percent of whatever you put on it. Why then, would you douse it in synthetic fragrance chemicals, toxic preservatives, heavy metals, artificial colors and ingredients linked to hormonal disruption and cancer??? That IS what you’re doing if you use most traditional skincare products. Meet Green Goo, a line of all natural skincare formulas created with the timeless herbal wisdom to produce Food for Your Skin™. The peeps at Green Goo use only the purest, most sustainable herbs and essential oils. Their herbs are harvested at their peak from organic farmers or organically grown in house. Next, they infuse their fresh and dried herbs in organic oils to increase the medicinal value of their products. This process maximizes the potency, taking healing properties of the plants to the next level. Does not contain Aluminum, Propanediol, propylene glycol. 100% all natural herbs and oils. A positive impact on the planet. Green Goo’s Animal First Aid products help support the planet. All sales support the 1% for the planet. Additionally, they have partnered with: World Vision, Mercy in Action, Mandela Foundation, Snowball Express, Summit for Soldiers, the Pacific Crest Trail, and John Hopkins, St. Jude’s Children’s Hospital. By purchasing Green Goo products, you are helping to make a difference, One Tin at a Time. 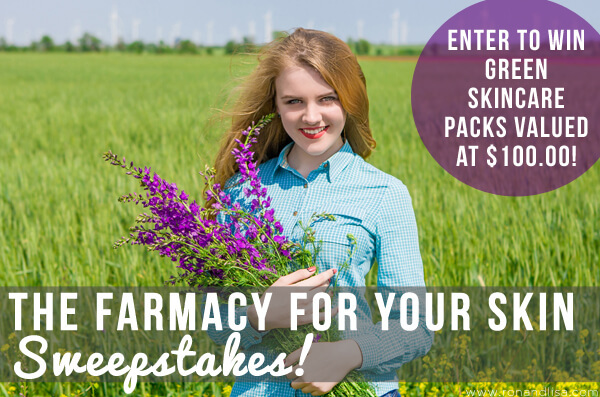 Who’s Ready to Win a Green Goo Skincare Travel Pack and Deodorant Pack? Two super lucky first prize RonandLisa.com readers will win a Skincare Travel Pack valued at $24.95 & a Deodorant Travel Pack valued at $24.95 (ARV $100.00). Who’s ready to enjoy better skin, cleaner pits and a healthier planet?? Enter daily for a chance to WIN and please share this page with a friend, loved one – or anyone – that could benefit from eliminating toxic skincare and enjoying the power of plants. For every action below that you complete, you receive a specific number of entries. Click each individual action to enter yourself. For actions you have done in the past (i.e. you are already a fan of Green Goo on Facebook) just click directly on ‘I did this’. The eligibility of the winner will be verified by The Healthy Home Dream Team®. There is no mandatory entry. Each action will earn different numbers of entries into the contest. You may Tweet or share on Facebook or Google+ for an entry once per day. All other actions will only be counted once. Sweepstakes open to US residents age 18 and over. Contest ends 12/10/16 at 12:15am PST. The dry skin care to repair the sun damage and help with the cold weather damage. I like the skin care, and the fur & feathers! I like the First Aid Large Tin , thank you. Fur and feathers animal first aid kit looks great! All of their sun protection! I’m interested in their Hand Goo. I’m always looking for a great hand cream to keep in my purse and car! Great choice Lynne! Yes, this winter weather makes our skin extra dry and that’s a great idea to leave on in your car! Hard to narrow it down to one product as several seem wonderful. If I had to pick one, probably the hand goo. Deodorant Oval Rose & Geranium sounds amazing to use all their products do I have no immune system so using natural products is a must for me now. I’d be very interested in their pain relief salve. I would love the Skin Repair-Daily Replenishing Salve-Jar. I’d like to try the Face Wash with Calendula Flowers. It looks like it would be gentle and feel soothing. One of my favorite products is their Bugs Be Gone spray for animals. We live in and around lots of woods and this sounds perfect. I like the travel kits. I would love to try the Skin Care Travel Kit. I think a favorite of mine could be the Face Wash with Calendula Flowers. Thanks for a great giveaway! I’m into sunblock so I like their Solar Goo-30 SPF Sun Protection .7 oz Travel Tin. Tins are so convenient to stick in your pocket! Love them. Great choice Deb! Yes, love the travel size of their packaging. I keep the deodorant stick in my purse at all times!! green goo lavander and thyme deodarant! The baby balm keeps my son’s skin soft! I like the momma’s belly bar! Oops! I switched my last two entries. The Google+ url is in the Twitter spot and vice-versa. Sorry about that. always looking for a good product for my sons eczema . It makes me so sad that he is used to his dry skin. I really like: Natural Cleansing Bar & Dry Skin Care Set. We get dry skin living in Nebraska. The thyme deodorent sounds interesting. The Green Goo Chalk Bag is nice. I would love to try the solar goo! I would like to try the Animal First Aid salve for my pug dog’s nose and paw pads in winter. She is always getting chapped. I like the Animal First Aid to soothe and heal cracked, sore, and blistered paws. I like the Soap-Lavender & Comfrey Healing Bar. I like the Solar Goo-30 SPF Sun Block Travel Stick .6oz.